Villa Parl is a beautiful two bedroom villa, all with en-suite luxury bathrooms with a private pool hidden away in a tranquil rural setting. Villa Parl is a perfect villa escape for family groups. Villa Parl is a beautiful two bedroom villa, all with en-suite luxury bathrooms with a private pool hidden away in a tranquil rural setting. Villa Parl is a perfect villa escape for family groups, and couples alike looking for complete privacy. This charming modern villa is set in its own pretty grounds with spectacular views across the mountain valley to Patara beach. Furnished in contemporary style, the large open plan living and kitchen areas provide a high level of comfort. 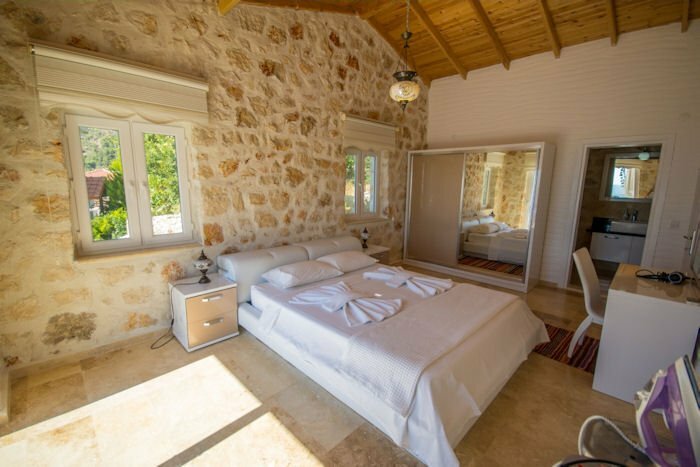 The spacious air-conditioned bedrooms - one twin, one double - both look out over the generous sized pool and each has its own en-suite bathroom tiled in travertine and with luxury wet-room showers. Outside, the pool, furnished sun terrace with loungers and sofas, BBQ, and shaded dining table add to the appeal of this lovely house. Surrounded by trees and plants you will feel totally relaxed in your surroundings. Away from the crowds but close enough to town with Kalkan just a between 15 minutes drive away.